Home gifts Love2love2love married life surprise valentine's Surprises! If some girls don’t like surprises, well change me because I love surprises and my husband knows that. 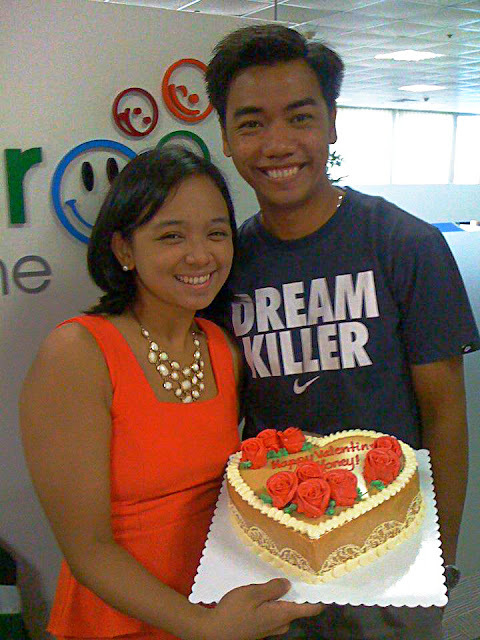 This year, we celebrate our 1st valentine’s day as husband and wife. I’m so excited to celebrate it, kala mo naman di kami nag cecelebrate araw-araw.. Hehe.. But of course, iba parin pag 1st db.. Anyway, our valentine’s day started by baking cupcakes, so we fell asleep by 4am in the morning. Ian told me that he needs to wake up as early as 6am since they have a meeting with their client based in France. What the?! 6am? Hello, kakatulog palang natin ng 4am.. Adik ka ba? But since, our body is totally weak that time, we woke up by 7, I prepared our breakfast while hubby took a bath. I insist him to go ahead first because he needs to be at the office before 8am while I need to clean up our house before leaving. I need to carry 2 big bags with 20 boxes of cupcakes from our house to office via commute on my own. Waahh.. Sorry, wala pa kaming car eh.. It’s so heavy as in, knowing that I wore beautiful orange-colored dress that time because we have a date after office. Booo.. When my officemate saw me, she immediately helped me and asked “Asan si Ian?”, I explained to her what happened and she can’t help but laugh, ang ganda nga naman ng suot ko tapos may bitbit akong 2 malaking bag.. Haha..
Moving forward, while I was talking to my friend who paid visit to our office and telling her about what happened this morning, I was surprised when the elevator open and I saw my husband carries 2 big box.. As in napa “WOW!” ako! My officemates, my friend, and even our security guard keep on teasing us.. I love flowers and Ian lovesto give me flowers every special occasion, anniversary, birthday, valentine’s day, etc. 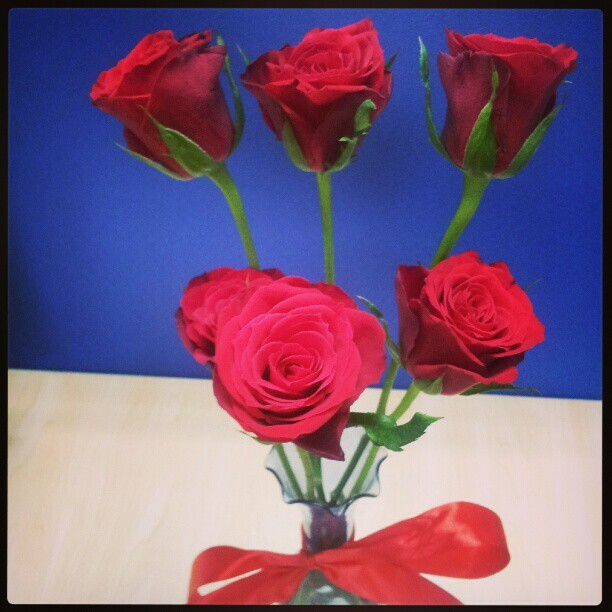 The day before Valentine’s day, he asked me if I want to receive a flower. I told him to just save his money for our plans this year but of course, deep inside saying “Syempre, valentine’s day yun kaya dapat may flowers ako..” Haha. Pakipot mode lang.. 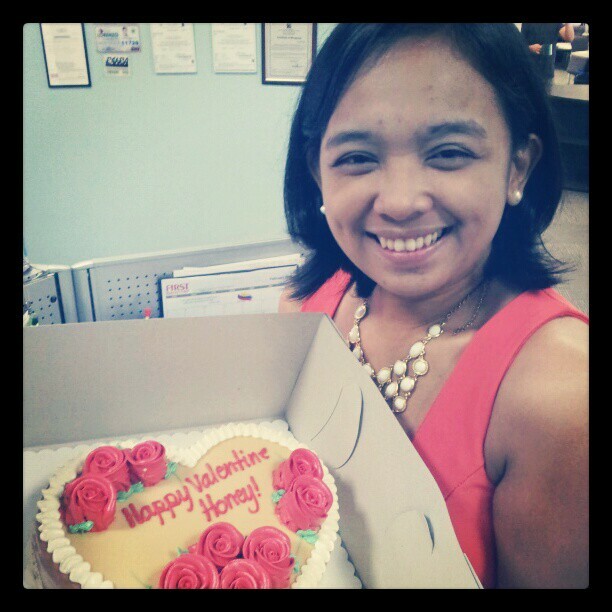 I didn't expect any flowers from him that day because he already surprised me with the cake, but as I go back to my table I was surprised when I saw a box of roses.. Waahhh.. May cake na ko, may flowers pa.. Ikaw talaga Mr. Ian Villareal, napaka SWEET mo talaga.. 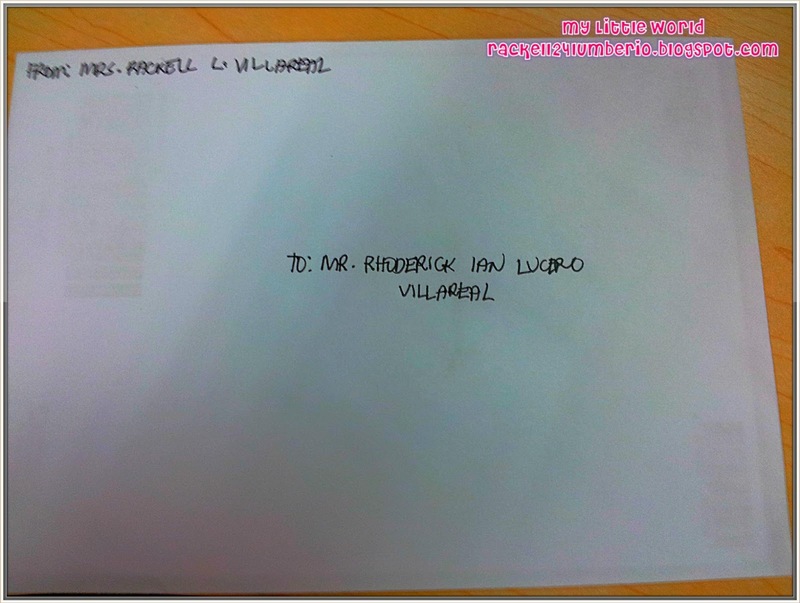 I was so touched with the letter because my husband appreciates all the things that I've done for him. Simple but meaningful. Thank you for the love and care. I will love you forever. 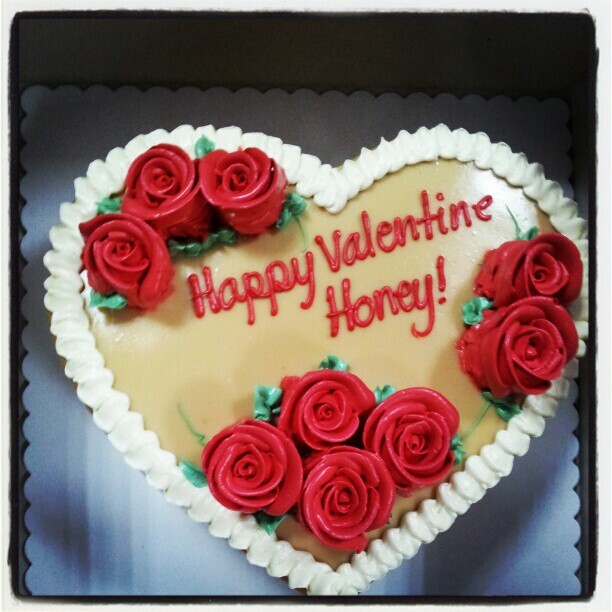 Happy Valentine’s Day Honey. Iloveyou so much Honey. If you think I didn't prepare something for him, you’re wrong! Because I arranged a little special for my husband. Before February, I already know what to give for my husband. 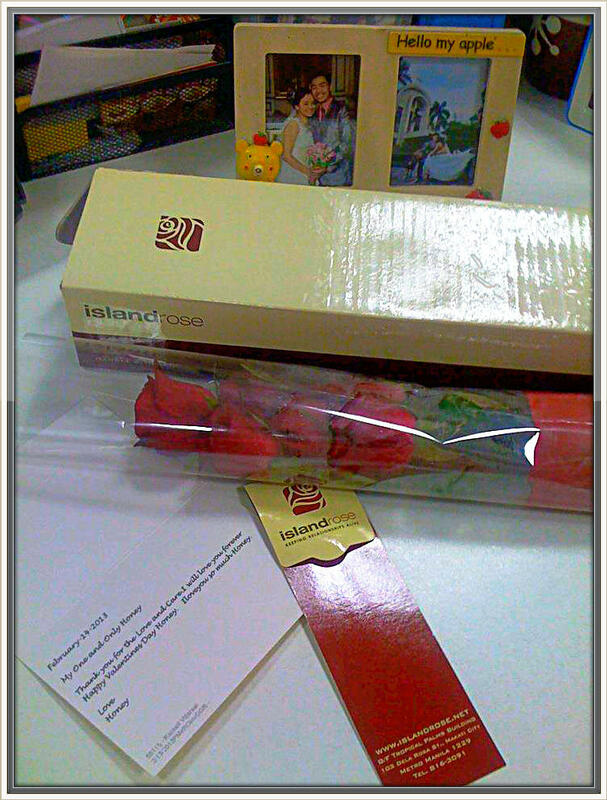 Since Ian also loves flowers, I ordered online a half dozen of red roses to be delivered to their office. I want to surprise him, iba kaya feeling pag nagpadala ka ng flowers sa lalaki. This is not my first time to do it, as far as I remember, this is my 5th time to send flowers to him and happy to say that he likes it. 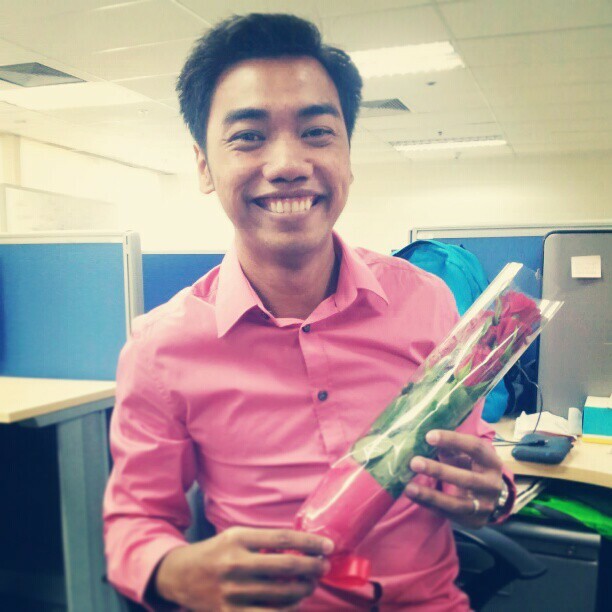 I mean, para daw syang artista nung nareceived nya yung flowers dahil sa pang aasar ng mga officemates nya.. Hihi.. When you’re married, it’s really hard to plan a surprise. This is a big challenge for me ever since I got married. Lalo na sobrang galing humuli ng surprise asawa ko.. Waahh..
Aside from flowers, I also love writing love letters. Yes! For almost 6 years of being together, I keep on sending love letters to Ian. How do I surprise him? While he’s taking a bath, I wrote a letter and put it inside his bag. Then, as he received his flowers, I told him that I have another surprise just look around the corner and you’ll find out what I am talking about. Haha. Pinahirapan ba naman daw.. Hehe.. After few minutes, I got a text message from Ian saying, “Nakita ko na! Kala mo ha!”.. Haha.. O db, galing maghanap ng asawa ko.. Sorry for the pictures, I only used my phone camera.